A day or two into my trip (which was only 3.5 days, after all,) when scouring for another delicious meal option before hitting the recoletta cemetary and the Sunday Feria, I came across Tea Connection, which I had never heard of before, (but seriously wish they would import to Berlin!) I was staying in Recoleta and planning to hit the Sunday Feria later in the afternoon, so I decided to stop in to one of the few locations near my apartment and enjoy some more healthy grub. First order of the day – fresh juice! I simply cannot get enough tropical flavors, (and yes, I know BsAs is not tropical, but they seem to have much better access to the good stuff than those of us stuck in the northern tundra!) 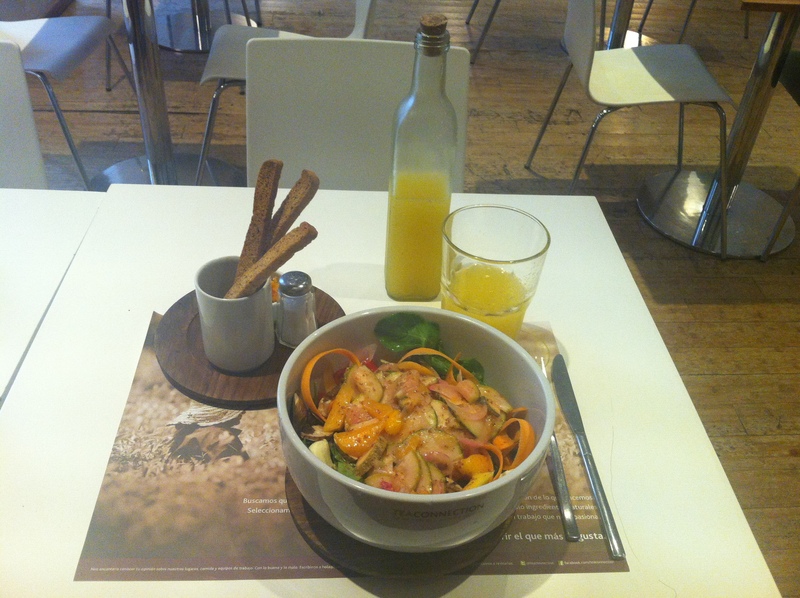 So I placed my order for juice and yet another inventive and delicious salad. The trend was catching on! Lo and behold, my food arrived and I had my very own bottle of juice! It’s like they knew everthing I wanted before I even had to ask! Even down to the healthy bowl of breadsticks – ha. So I chowed down, regretfully too full to have a tea, (but knowing I needed to save my resources for the lattes and ice creams to come later in the day when my legs were too tired to carry me,) and wandered my way over to the cemetary for what I always remember to be my favorite Feria in all of South America! Every Sunday the park in front of Eva Peron’s eternal home is cluttered with street vendors offering all variety of goods from leather bags to hand knitted scarves, paintings, pottery, jewelry, stones, and knick knacks a plenty. And on the sunny and warm days the grass is filled with people sipping mate and catching up with friends, often with some kind of live music to accompany their afternoon. It’s just a happy and peaceful place to be. And lucky for me I found just what I was looking for! 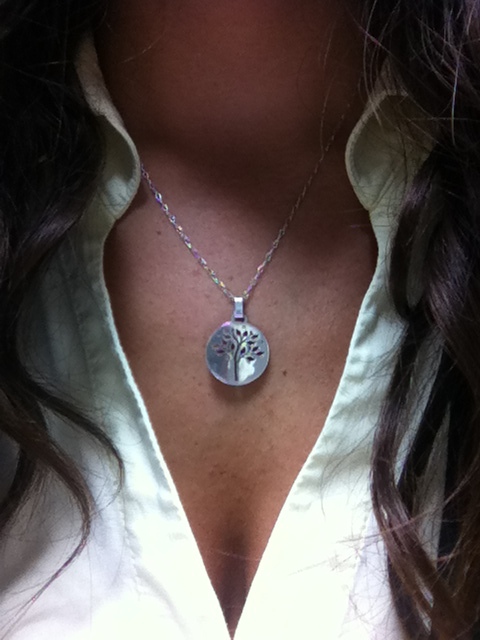 I spent a lot of time looking for a Tree of Life that I loved over the years, and never quite found one. So as I passed by this man’s stand who had created this piece of work personally, I told him how beautiful it was and continued on my way. Only to realize a few minutes walk away that, wait – what was I thinking, it was perfect! So I quickly walked back and tried it on, along with 4 or 5 other beautiful pieces of jewelry he had on display, and made my selection carefully. 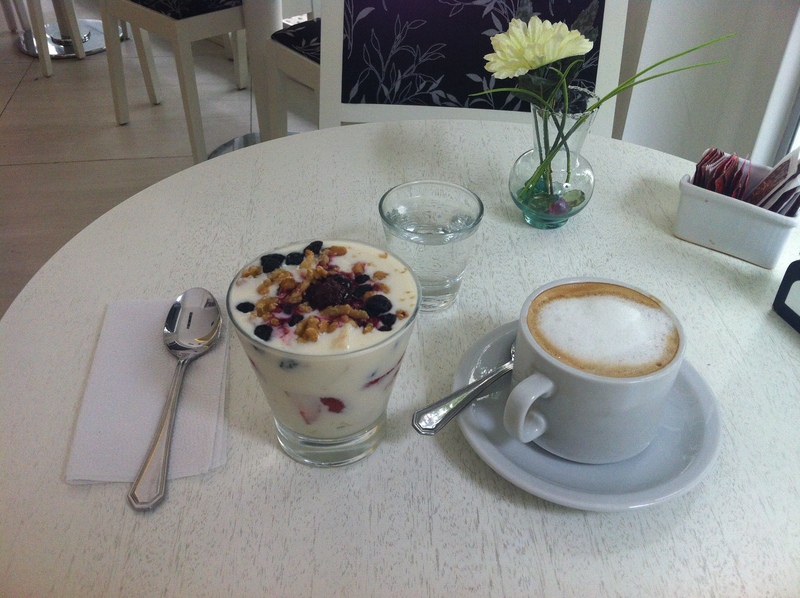 After a successful morning I decided to treat myself to a mid-afternoon capuccino and a snack. I wandered away from the park in the direction of my apartment and stumbled upon a quiet cafe with white trimmings – L’Avant Garde. A nicely designed place to catch a break. I saw someone munching on some type of yogurt parfait and decided it was a healthy enough alternative to all the ice cream I’d been eating, so I opted in. Another afternoon complete, and it was off to the pool to catch some of those rays my poor pale skin had been so severely deprived of!